Amanda Mackey's "She Who Dares Wins" is a story of a woman finding strength when she needs it most. The novel, which has elements of suspense, mystery, and romance, is about Dakota Livingston, a survivor of an abusive relationship. Dakota escapes her violent past in an island paradise when she falls in love with movie actor Kyle Rutherford. But just as the relationship is intensifying, Dakota flies home to tie up the loose ends of her past relationship, only to have her plane crash and her wind up on a remote island, where she befriends a boy who was also abused. The plot of the story is both engaging and fast-paced, without losing its meaning. The writing of the book is descriptive, and it came as a surprise when I learned that this is Mackey's debut novel. The characters are incredibly dynamic, and each has their own trial to face. It was particularly interesting to see Dakota overcome her trust issues (from her previous relationship) as she got closer with Kyle. 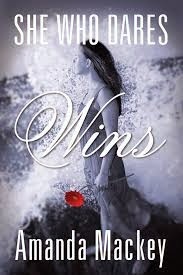 "She Who Dares Wins" is the perfect book for anyone wanting to read a story about overcoming obstacles in a plot filled with romance and suspense.